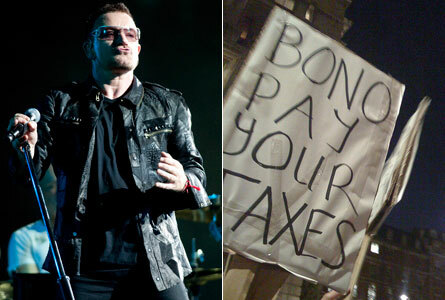 Bono Attends OWS Anti-Corporation Rally and Steve Jobs Memorial.. Whats With That? STANFORD, California (Reuters) – Silicon Valley luminaries, politicians and celebrities were among the several hundred people at a private memorial service for late Apple Inc co-founder and tech visionary Steve Jobs on Sunday. Guests arrived in dozens of black limousines and walked up a path lighted by hundreds of large white candles to Memorial Church in the heart of Stanford University’s campus. The event was heavily patrolled by police and security and walled off to the public. Apple CEO Tim Cook, who took the helm of the world’s largest technology corporation in August when the industry icon declared he could no longer lead Apple, walked up to the chapel with a man dressed in the garb of a Buddhist monk. Maria Shriver, estranged wife of former California governor Arnold Schwarzenegger and U2 frontman Bono stopped to exchange words with others in the courtyard before heading in. Bono attending OWS anti- greed rally and Steve Jobs Memorial….. taking care of business..
Oakley made headlines Wednesday for donating expensive eyewear to the Chilean miners who were rescued from a San Jose mine. Apple CEO Steve Jobs was also among those who offered up goods to the rescued miners. Reuters reports:The miners are facing new-found celebrity. A local singer-turned-businessman has given them $10,000 each. Apple boss Steve Jobs has sent them all a latest iPod. A Greek firm has offered an islands tour. Real Madrid and Manchester United have invited them to watch them play in Europe. 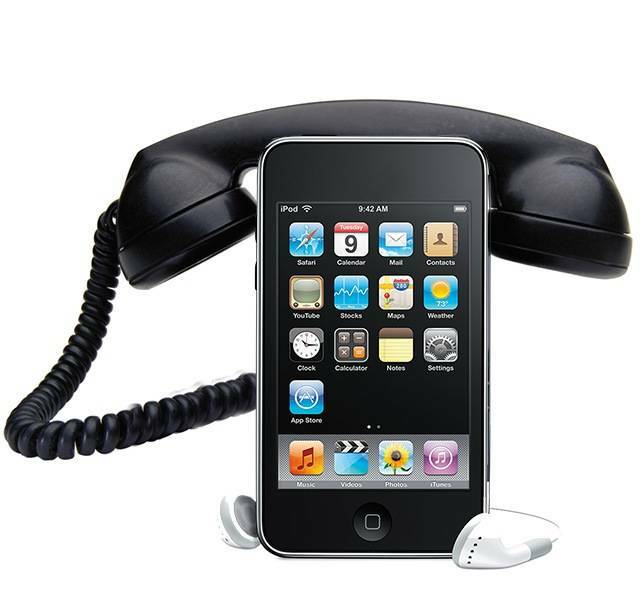 With less than advanced Chilean technology, miners may need to improvise with their new Ipods..
Jobs admitted that the iPhone 4 has more dropped calls than its predecesser, the 3GS, but said it’s just a difference of one call per 100. He also said complaints to AppleCare over reception issues have been few, and the phone has a return rate of 1.7 percent — lower than the 3GS and industry standards. 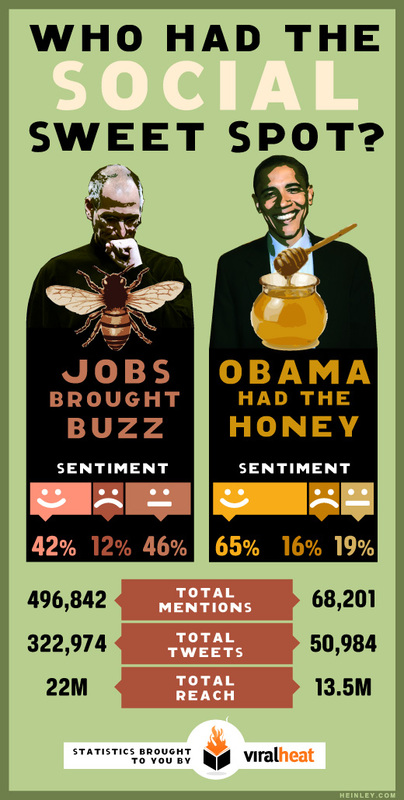 Despite admitting there might be an issue, Jobs said some of the problem seems to be media hype. He said just 0.55 percent of iPhone users have called AppleCare to report antenna problems while there has been a return rate of 1.7 percent. Time for Apple to take the Toyota beatdown.. Press and Congress seem to hate success..
Apple CEO Steve Jobs responded to weeks of criticism over a faulty antenna in Apple’s iPhone 4, saying that the phone’s flaws are no worse than other smartphones. 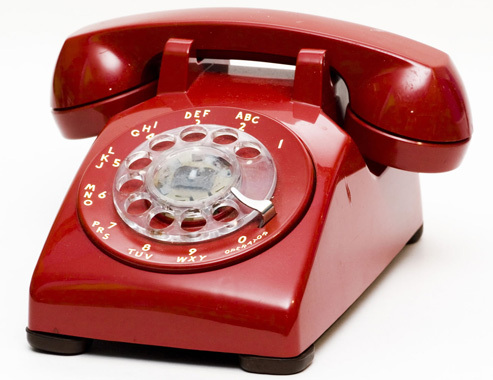 Still, he said Apple would give a free case to all iPhone 4 owners to fix reported signal problems. “This is life in the smartphone world,” Jobs said. “Phones aren’t perfect. So what’s the solution? 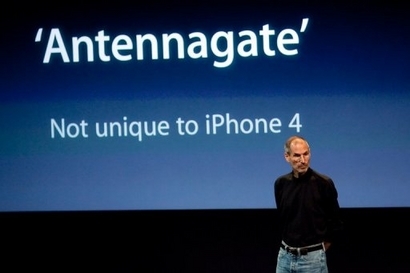 Jobs says already released iOS 4.0.1 Thursday, which fixes the issue of how the phone calculates signal strength. And if you already bought an iPhone 4 or you buy one before Sept. 30, you will get a free bumper to cover the phone. 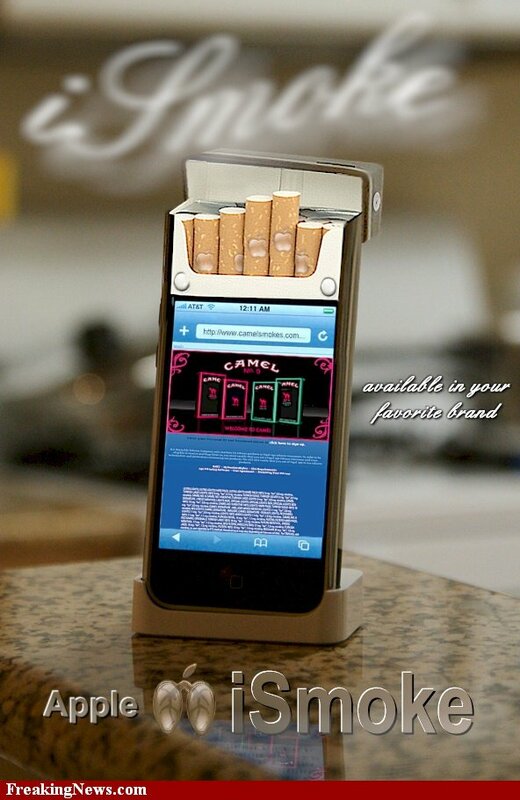 So if you place your Iphone in the new cell phone bumber cover this should eliminate future problems.. Cell phone covers come in red or black.. If Apple admitted the hardware flaw, its PR problem would start to go away. But it hasn’t, and news organizations including Consumer Reports and Engadget continue to prove the antenna is faulty. Worse, countless consumers have weighed in on the matter … and that’s Apple’s biggest problem. Steve Jobs sqeezed by his phones..
Apple boss Steve Jobs has responded to complaints about the new iPhone 4 losing its signal by telling users to ‘just avoid holding it in that way’. Angry users have complained that the $500 phone’s reception suddenly plunges to almost zero when they simply hold it in their hand. Dozens of videos have been placed on YouTube showing the iPhone 4 losing signal the moment the metal antenna that surrounds the edge of the new device is covered. Jobs issued his bizarre advice as he responded to an email from a user on the Ars Technica technology news site who had complained about the sudden loss of signal. 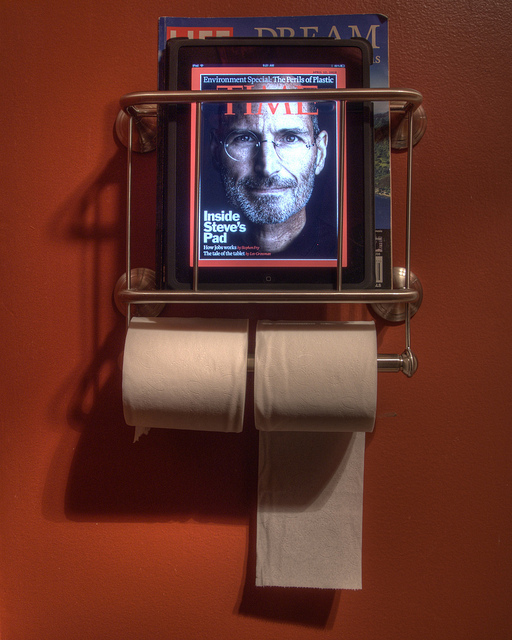 In an astonishingly blunt response, Mr Jobs replied: ‘Just avoid holding it in that way. All phones have sensitive areas’. 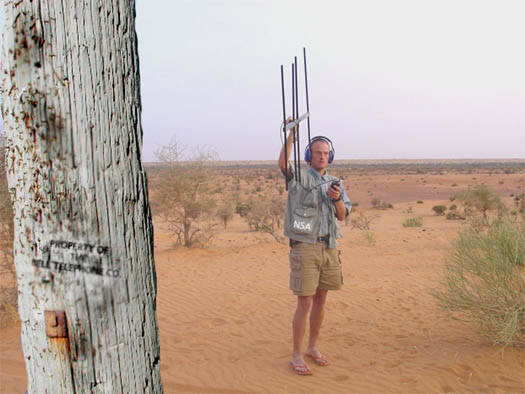 Hold the antenna more towards the middle and not along the bottom. Can you hear me now? Iphone 4 users can be sensitive too..